Bethesda, of course, for creating Skyrim. UESPWiki, for the numbers used to create the condensing recipes. ﻿Elianora﻿﻿, for the idea on how to "create" a new animated item with just vanilla assets. Darkfox127﻿, for his many informative scripting tutorials. sirjesto, for the idea that became the Ultimate Compatibility Edition. ChrisHpz﻿, for pushing me to get this done (Thanks, brother). 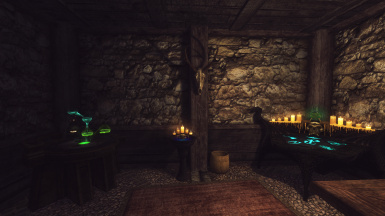 Moved the Condenser in the Winterhold Jarl's Palace to avoid clipping with an ELFX edit. Updated UCE to actually add 1 token to the warden's chest. Fixed the bug where an NPC could trigger the auto-condensing script. Original Skyrim Version can be found here! Many thanks to Soul Mystique for the showcase video! 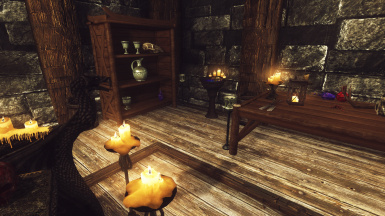 I don't know about you, but I hate it when my higher-level characters keep finding low-level potions and poisons in chests, houses, dungeons, draugr, etc. When you have 300+ HP, that potion that heals 25 isn't of much use. Likewise, weak poisons aren't of much use against giants and dragons. What can you do with them? Take them home and fill your chests with them? Sell them to the apothecary for a few coins? Just leave them lying around? And soul gems? By the time you can enchant your own items to a better quality that you're finding, why keep all those filled petty soul gems, when all you want are grands? Well, now you have another option. The Mystic Condenser will combine 2 or more potions/poisons/filled soul gems of the same type into 1 or more of their higher-level counterparts, with no loss of efficacy. 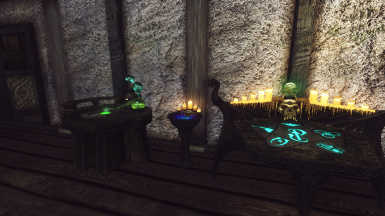 For example, 3 standard Potions of Healing (restore 50 points of health each) will condense down to 2 Potions of Plentiful Healing (restore 75 points of health each), preserving the total 150 points of health, while taking up 0.5 less weight (and being worth a few more septims as well). The Mystic Condenser works on all standard potions/poisons/filled soul gems in the game. It does NOT work on player brewed potions and poisons. Additionally, the level of the potions or poisons that can be condensed is based on the player's level. If you're not high enough level for the potion or poison to appear in the standard leveled lists, the recipe will not appear on the menu. Also, if you don't have enough potions/poisons/soul gems to condense, the recipe will not appear on the menu. This is to not fill your menu with greyed out items (currently there are 199 different combinations). Where can you find these wonderful devices? They are located in the palace of the Jarl of each hold. They are usually to be found in each court wizard's work area, so if you don't find one immediately as you enter the palace, you may have to search a bit (I'm looking at you, Palace of the Kings!). 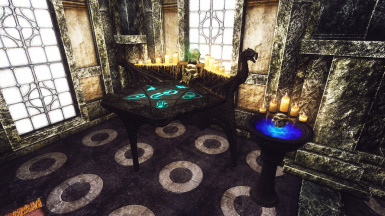 They can also be found in the College of Winterhold's Archmages Quarters, both Dark Brotherhood Sanctuaries (Dawnstar Sanctuary's is available after purchasing the "Poisoner's Nook" upgrade), and the Ragged Flagon Cistern. What's that? 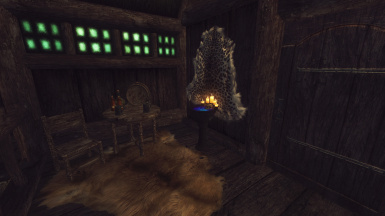 You don't want to have to keep going back to the Jarl to use a Condenser? Well, if you have the ingredients, you can craft a "Mystic Condenser Token," which will allow you to place a Mystic Condenser anywhere you'd like. To do so, first Save Your Game. This is in case you end up placing a Condenser in the wrong place. Second, click to "equip" the token. DO NOT JUST DROP IT. You must click it, like a piece of armor or a weapon. This will place a Condenser right in front of where you are standing, facing you. If you don't like where it appears, re-load your save, reposition yourself, and try again. Dawnguard DLC adds Condensers to both Fort Dawnguard and Castle Volkihar. 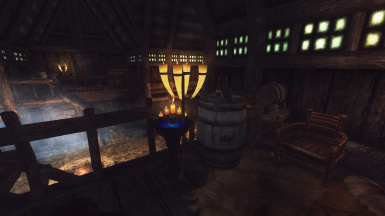 Hearthfire DLC adds Condensers to all 8 player homes. 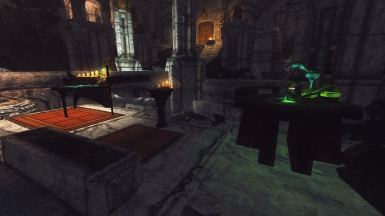 Dragonborn DLC adds Condensers to several locations around Solstheim. 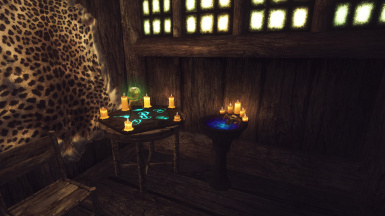 Animation - Using the Mystic Condenser now animates just like every other crafting station. Automatic Condensing - When you activate the Mystic Condenser, it will now automatically condense all of your Potions of Healing/Magicka/Stamina, all of your Filled Soul Gems, and will also combine all of your soul gem fragments into Black Soul Gems. If you don't want this to happen, simply de-select the option in the MCM Menu. More Mystic Condenser locations - I've placed a few more Condensers throughout the world, in various dungeons and the like. No, I'm not going to say where. NEW in 2.2! Added recipes for condensing Frostbite Venom. ﻿Just use your favorite mod manager to run the AIO FOMOD installer. Just choose whichever compatibility patch you need, and let the installer do the rest. Uninstall the old version with your mod manager, or just delete the .esp file(s) and the .bsa file. Then install the new version. You should be able to remove this at any time without hurting your save. Just deactivate the mod with your manager. 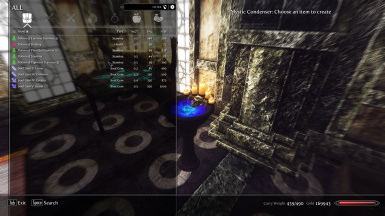 This mod should be compatible with most everything, except mods which modify the areas in which the Condensers are placed. So, you may find the Condenser buried within another item (or not). If this doesn't work for you, than perhaps the below mentioned "Mystic Condenser UCE" is what you need. There is an optional file called "Mystic Condenser UCE" in the files section. This is the "Ultimate Compatibility Edition." Install this INSTEAD of the main file. This version places absolute NO Mystic Condensers in the world, so as not to conflict with any mods. 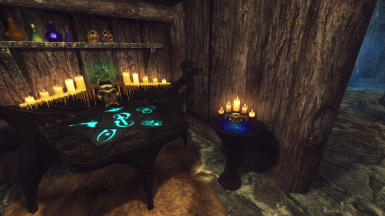 Instead, you will find one (1) Mystic Condenser Token in the Warden's Chest in Helgen Keep. Use that token wisely to place your first Condenser wherever you wish. Thanks to sirjesto for the idea! Elianora, for the idea on how to "create" a new animated item with just vanilla assets. Darkfox127, for his many informative scripting tutorials. ChrisHpz, for pushing me to get this done (Thanks, brother).